I hope you've enjoyed Part 1 and 2 of my series "Natural Girl Gone Thrifting".This article will be the last one in my series, for now. Because I really like thrift shopping, I may do more articles about the topic in the future. My hair was styled in the front flat twist style with a big puff in the back. I put a black tank top under the sleeveless denim, button-up shirt. I placed a black, half sweater on top of the thrifted denim top. I wore the plaid tank with a tan half sweater and khaki pants. 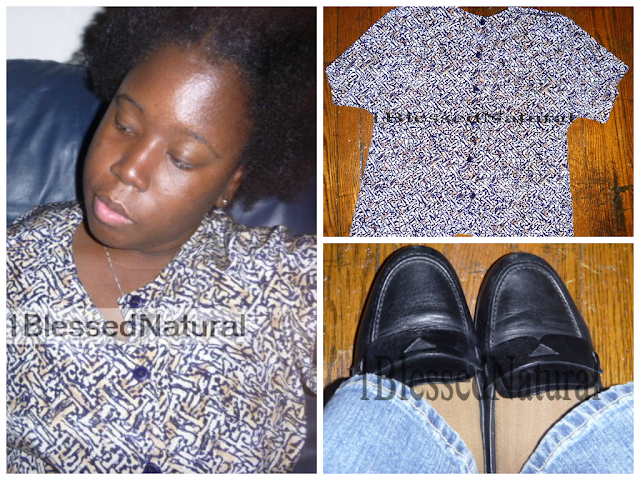 I paired the tribal print shirt with blue jeans and black penny loafers. The thrift shopping challenge was a lot fun. I was able to see just how much you can be stylish on a budget. I have noticed a lot of teenagers have hopped on the thrift shopping bandwagon. My niece said the trend was started by Macklemore & Ryan Lewis song, "Thrift Shop". I hope that many of you were able to learn from my experience and start your own thrift shopping challenge! Are YOU going thrift shopping? Related Articles: Natural Girl Gone Thrift Shopping: Part 1. Natural Girl Gone Thrift Shopping: Part 2.